New Delhi: India will be unable to meet its deadline for introduction of the single goods and services tax (GST) by 1 April, after all the state governments, with the exception of those of Kerala and Jammu and Kashmir (J&K), refused to sign on and instead proposed that the launch of a unified tax regime be deferred by a year to 2011. The empowered committee of state finance ministers that met on Wednesday has asked for another meeting in the first week of January to finalize the contentious issue of tax rates. GST has been billed as the single biggest tax reform initiative that will economically unify the country and do away with the myriad tax structures that are currently in place. TFC has computed that the implementation of GST will grow the economy by as much as an additional 1.5 percentage points every year over and above the current rate of growth. Immediately after the meeting of the empowered committee, Madhya Pradesh finance minister Raghavji, who uses only one name, said: “Our demand for deferring the implementation was supported by even Congress-ruled states." Bihar finance minister Sushil Modi said the move to GST could be delayed by a year. 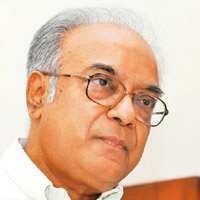 The empowered committee’s chairman, Asim Dasgupta, finance minister of West Bengal, admitted as much when he said that the Central government had been unable to introduce GST legislation in the winter session of Parliament, which is due to conclude on 21 December. Once Parliament approves the legislative changes by a two-thirds majority, it will have to be endorsed by the assemblies of majority of the 28 states by a similar margin. To implement GST, the Central government will have to introduce a Bill seeking amendments to the Constitution. Currently, the power to tax have been divided between the Central and state governments. Dasgupta added that India’s finance minister Pranab Mukherjee “has said he is very willing to discuss (this) with us in January after this Parliament session is over". He said, “After our meeting with him, we would be able to take a decision on constitutional amendments and other preparations." The empowered committee will reassemble on 7 January in New Delhi for a two-day meeting, which will also see the review of the study undertaken by the National Institute of Public Finance and Policy on the revenue implications of the introduction of GST for states. This will be preceded by a meeting of the state finance secretaries on 6 January. According to a person familiar with the development who did not want to be identified, the representative for Tamil Nadu, endorsed by Raghavji, argued for more time as states were still stabilizing the value-added tax regime that India moved to in 2005. 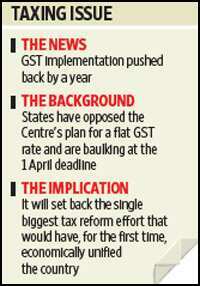 Some state finance ministers, who were pushing for deferment of the GST deadline, maintained that industry representatives were opposed to the introduction of GST mid-way through the year, a reaction to a proposal to roll it out by June instead of 1 April, the beginning of the fiscal year for the Central and state governments, and most Indian firms. Vivek Mishra, partner at audit firm Ernst & Young, said he wasn’t surprised by the delay given the complexity involved in moving to a GST regime. He added that the new tax regime could be delayed beyond 2011. “Based on the amount of issues to be decided, all the elements are yet to be in place. It will take one year only to have the design of GST in place. It may take another two years to implement it," he said. Asit Ranjan Mishra and PTI also contributed to this story.